Our totally ignored beloved fish, Red Tail, passed away on Saturday after over a year with us. I came down in the morning and noticed him laying on the rocks at the bottom of the bowl. I wasn't that surprised since he hadn't been eating as much and I think it was just too cold in the house for him. 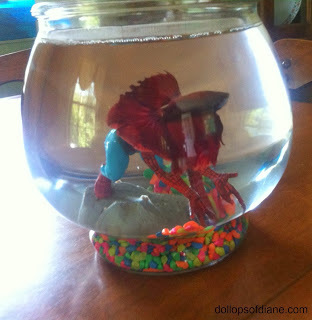 He was a Beta fish and wanted to be swimming free in the tropics not held up in a bowl on our desk with only a Spider man figurine to keep him company. So Saturday morning I did what any busy mom does and totally ignored him and carried on with the day while waiting for a kid to discover his demise. You know what? No one noticed. So that night I flushed him down to the big open sea (or our septic - details, details). I then washed out his bowl and put it in the basement. That was Saturday and it's now Tuesday afternoon and still the kids have not even noticed that he's gone. Poor, poor Red Tail. I assumed Isabelle would be the first to notice but I think she's been preoccupied with all her birthday festivities and after school activities. Henry has no excuse since one of his classmates today even asked him what his fish's name was. You'd think that might encourage him to go give Red Tail a hello when we got home but nope. So the desk remains a bit emptier and I'm just waiting for someone to realize it. Henry's school friend is coming over Friday for a playdate and at this rate I think she'll be the first to notice. Poor, poor Red Tail - swim on my friend.